The Sisters of Notre Dame, founded in Coesfeld, Germany in 1850, arrived in Cleveland in 1874. Within four years, they founded Notre Dame Academy. Because of growing enrollment, the Academy relocated to Ansel Road in 1915. It thrived in the following decades until, in the early 1950's, the school began feeling the effects of Cleveland’s population shift to the suburbs. The movement of the school in 1963 to Munson Township in Geauga County offered the school new life, increased enrollment and the availability of a Catholic education for young women from a three county area. Enrollment was healthy until the mid-1980s. This led the Sisters of Notre Dame to study the option of co-education in Geauga County and to collaborate with those committed to Catholic secondary education. 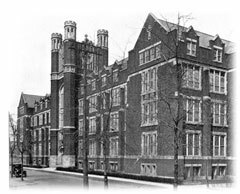 In early 1916, a new diocesan Catholic high school for boys, Cathedral Latin School, was built in Cleveland. The Brothers of the Society of Mary (Marianists) and diocesan priests staffed the school. Cathedral Latin’s enrollment peaked in 1963, ironically the same year Notre Dame Academy moved to Geauga County. The 1970s brought a steady decline in enrollment, leading to Latin's closing in 1979. Cathedral Latin Alumni Association remained active with one driving force: to see their school reopen. This dream was realized in February 1987 when the Sisters of Notre Dame invited the Cathedral Latin Alumni Association to join them in forming Notre Dame-Cathedral Latin School. In 1988, these two strong traditions united to promote their shared values: faith formation, academic excellence, school as community, commitment to service and, devotion to Mary. In 2003, the Sisters of Notre Dame made an important strategic decision. In order for Notre Dame-Cathedral Latin to successfully respond to the numerous challenges facing Catholic education and to effectively use its available resources, the Sisters of Notre Dame implemented a sponsorship form of governance. A Board of Directors assumed responsibility for the school’s governance in July, 2003. During the following year, the Board developed a strategic plan to guide NDCL through 2009. In this time period, the President-Principal model of administrative leadership was implemented and the Board doubled in size. Since then, Notre-Dame Cathedral Latin has taken on a life of its own. Under the transformative leadership of President Sr. Jacquelyn Gusdane, SND, NDCL completed its first comprehensive capital campaign which provided over $8 million in upgrades, renovations and new facilities. Each year, between 2008 -2016, a new project enhanced the NDCL experience for our students: artificial turf and lights on Lozick Field at Lion Stadium; six tennis courts, west parking lot, remodeling of the cafeteria, significant upgrades for technology and security, remodeling of the lobby and main hallway, Pat & Janet O’Brien Center for the Performing Arts featuring the Sam J. Frankino Stage, Eugene T. Baker ’37 Gym, the repurposing of the library into the Sisters of Notre Dame Learning Commons and the renovation of and dedication of Annunciation Chapel and the Fr. Jim O’Donnell `48 Campus Ministry Center. Today, here is little doubt that our young men and women enjoy the finest in 21st Century education. In 2015, the Notre Dame Schools Board was established. This new Board, comprised of graduates, stakeholders, community leaders and other professional, serve to govern over both Notre Dame Elementary School and Notre Dame-Cathedral Latin School. The Board of Directors’ charge is to sustain and strengthen Catholic education on the campus as NDS move into the future by establishing policy, assuming fiduciary responsibility, developing and monitoring the campus Strategic Plan. 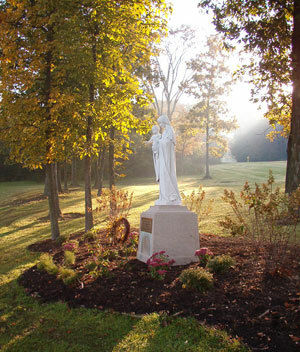 Grounded in the Educational Vision and Principles of the Sisters of Notre Dame, we “journey together in hope as witnesses and catalysts for the responsible care of all God’s creation and for justice and peace, especially for those on the margins of society.” The Board launched Strategic Plan 2016-2019, Better Together in July, 2016. In 2017, Notre Dame Schools welcomed its first lay President, Dr. Michael Bates. As President, Dr. Bates’ responsibilities will include implementing the new strategic plan, directing the advancement and finance teams, and overseeing marketing and enrollment management.